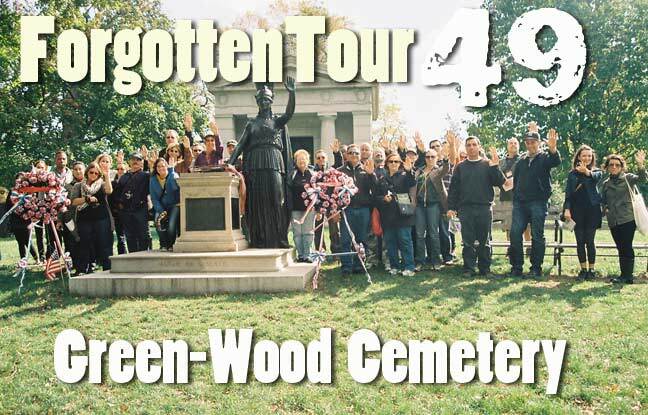 Green-Wood Cemetery, in Brooklyn between the neighborhoods of Park Slope, Sunset Park, Windsor Terrace and Kensington, has proven to be a Forgotten favorite — this was the 3rd such Green-Wood tour in the series which here attains its 49th entry. 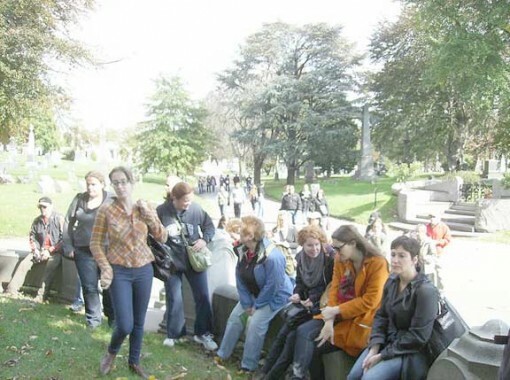 The cemetery, instituted in 1838, is so vast that it’s impossible to do the same tour twice. According to legend, this greenhouse, sporting a wrought-iron “Weir” at the top (with the added-on McGovern latter-day partner’s name) originally appeared in the St. Louis, MO World’s Fair in 1904. 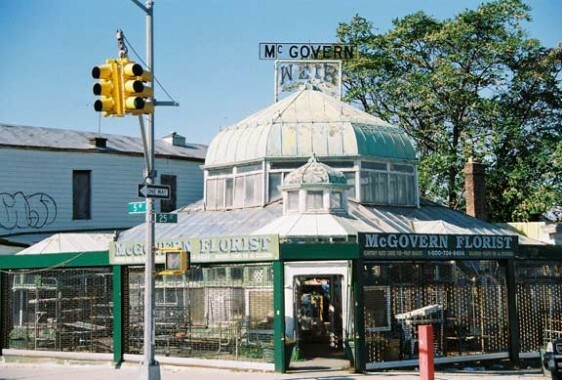 James Weir opened the floral business with plant nurseries and greenhouses in the Yellow Hook in what is now Bay Ridge in the 1850s. After a yellow fever epidemic struck the area, taking a heavy toll, Weir proposed renaming Yellow Hook as Bay Ridge, since it was built along a hill facing Upper New York Bay. The region formally approved the name change in 1853. The high red sandstone gate and offices are entered at 25th and 5th Avenue. This entrance was opened a couple of decades after the cemetery first opened — the original front gate was between 26th and 27th Streets. 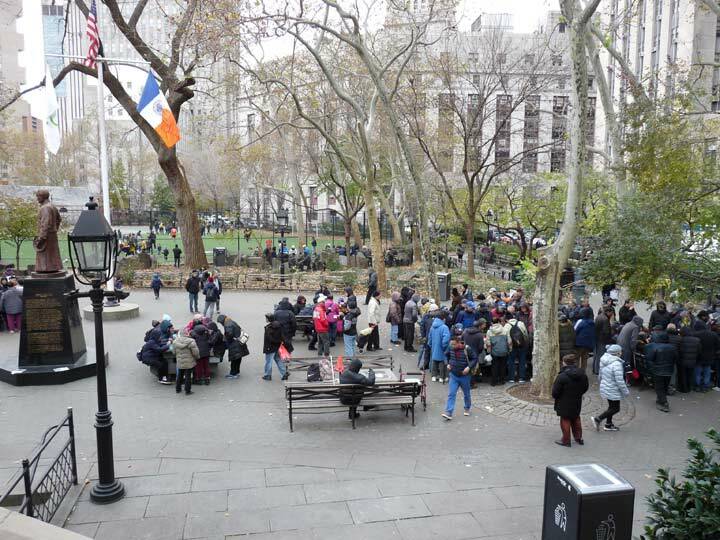 It was designed by Richard Upjohn, the architect of Brooklyn Heights’ Grace Church and many other prominent places of worship, and was constructed between 1861 and 1863. Look for the rich details: a double arch, three spires, religious reliefs with a Resurrection theme, and a bell that rings to announce every funeral procession. Also note that a colony of monk parrots has made its home in the central tower: you will see a bright flash of green now and then while regarding it; the parrots’ cheerful calls interrupt Green-Wood’s silence in the main gate’s vicinity. 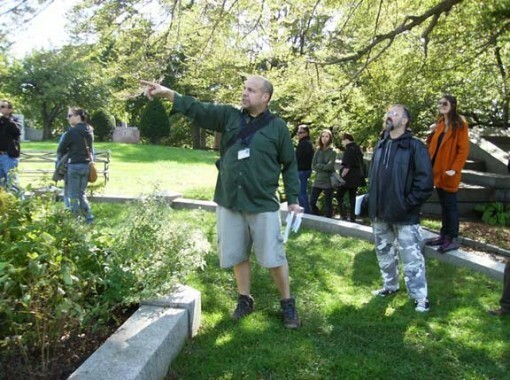 Tour co-host Richard Melnick of the Greater Astoria Historical Society points the way. GAHS is in association with FNY in promoting tours and other events. In the 1840s city official James Gerard traveled to London, England where the police wore uniforms, unlike NYC. The blue coat and button front uniform designed by Gerard’s tailor are still the basis for NYPD uniforms today. The Brooklyn Theatre Fire Monument recollects a devastating fire at the Brooklyn Theatre downtown where 1000 patrons were enjoying a production of The Two Orphans. A fire broke out in the theatre, panic ensued and 278 lost their lives. A mass burial of 103 victims took place here for people whose families could not afford interment elsewhere. Two separate religious traditions are found on Albert Parsons’ family’s burial site, which contains references to both Parsons’ Christian religion and Parsons’ profession as adventurer and Egyptologist. The figures of Joseph, Mary and the child Jesus appear alongside the Sphinx, Osiris and the sun, representing Ra. This is one of three pyramid-shaped tombs in the cemetery. 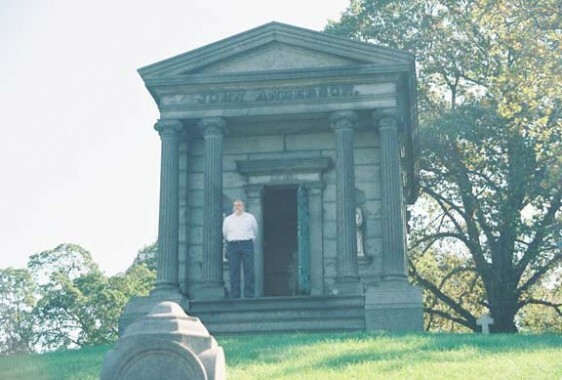 Green-Wood Cemetery’s official historian Jeffrey Richman stands outside the mausoleum of John Anderson and family. 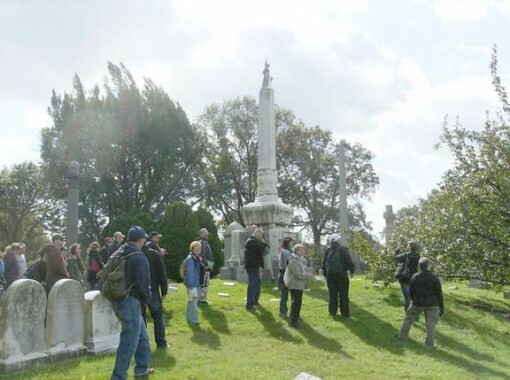 Our tour was able to enter because some mausolea were being opened as part of the Open House NY 2011 weekend. 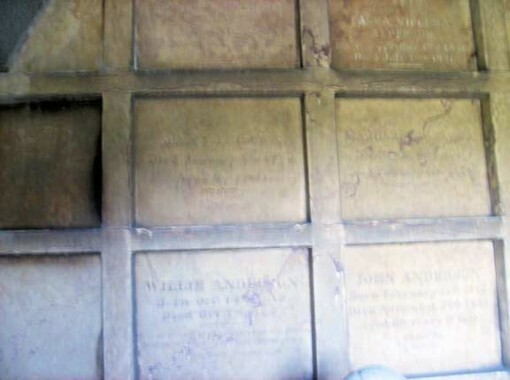 Tobacconist Anderson’s mausoleum occupies a prominent spot at a fork in the road. He ran afoul of public mores when, after considering running for mayor in 1842, he became suspected of the murder of Mary Cecilia Rogers, the “Beautiful Cigar Girl” who assisted him promoting his products. His political career was dashed, though he wasn’t indicted. We ascended Battle Hill, one of the theatres of the 1776 Battle of Brooklyn (or Long Island) in the Revolutionary War. It was a rout for the British, but enough Americans escaped to fight again. 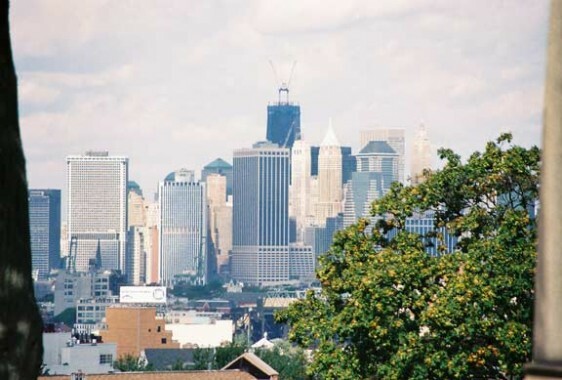 This promontory is in easy view of Upper New York Bay, Manhattan and New Jersey beyond. 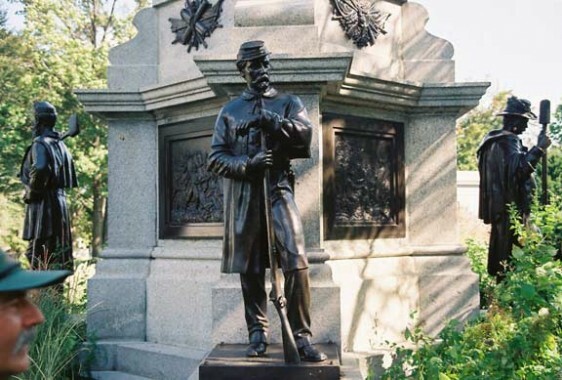 The Green-Wood Cemetery Soldiers’ Monument, erected in 1869, 4 years after the Civil War was won, commemorates the 148,000 soldiers from New York who fought it. Soldiers hold a rammer, ax, a rifle and sword, and there are additional sets of bronze bas-reliefs depicting war scenes. Minerva and the Altar of Liberty was commissioned in 1920 by ink king Charles Higgins; his company is still going strong and his old mansion still stands on 9th Street between 4th and 5th Avenues. The ink factory, as a matter of fact, stands behind it. 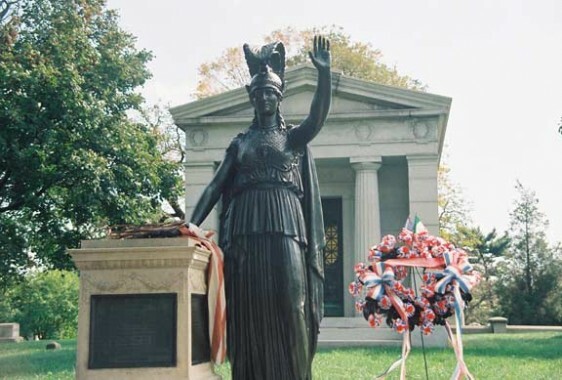 Higgins also built his tomb behind Minerva. She stands on a high hill, acknowledging the Statue of Liberty, clearly visible through carefully pruned trees. A new condo development came close to ruining the Liberty view, and other planned condos constantly threaten it. Edward Litchfield’s monument is opposite Bernstein’s modest gravestone. Litchfield is the father of the Gowanus canal; he formed the Brooklyn Improvement Company for the express purpose of dredging the Gowanus Creek, then a fresh stream, and making it navigable. His mansion still stands in Prospect Park near 5th Street. Charles Ebbets was an early owner of the Brooklyn franchise in the National League. The team, alternately known as the Trolley Dodgers, Bridegrooms and Superbas, played in Washington Park at 4th Avenue and 5th Street and used the ruined Old stone House as a clubhouse until moving into the state of the art ballpark Ebbets built in Crown Heights. The Dodgers were the first integrated major league club and broke through with a World Championship in 1955. They moved to Los Angeles 3 years later. 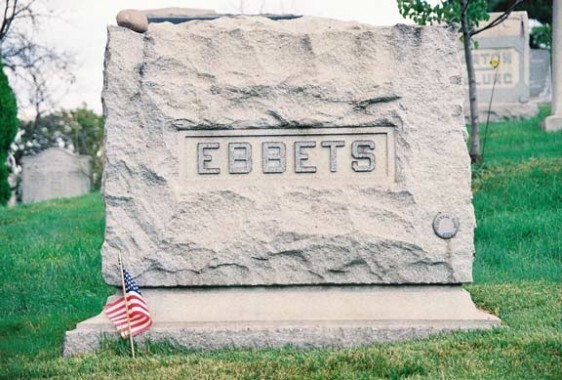 The Kamies monument directly behind Ebbets’ stone marks the highest point in Brooklyn. Henry Chadwick is regarded as “The Father of Baseball.” A sportswriter who became the first baseball editor, he assigned numbers to positions (1-pitcher; 2-catcher; 3-1B and so forth); invented the terms: assist, base hit, base on balls, whitwash, double play and many more. He is enshrined at the Hall of Fame in Cooperstown. 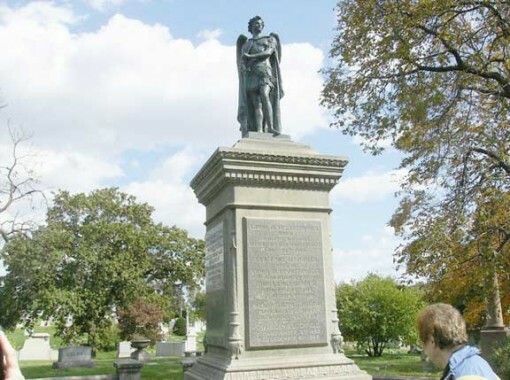 His monument is topped by a granite baseball and has bronze catchers mask, bat, ball and glove. The plaque is diamond-shaped, and stone bases define the plot. Rich found a small Pan Am toy plane at Juan Terry Trippe’s stone. 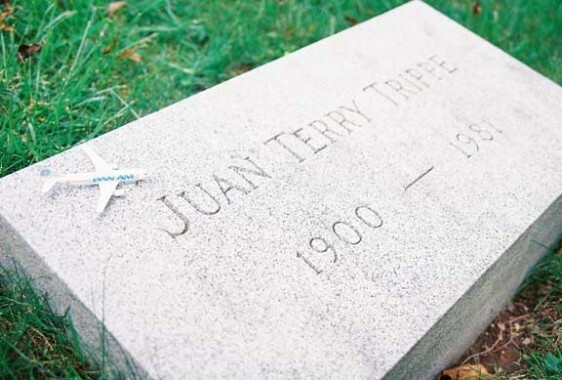 The founder of Pan American Airways, Trippe was a Naval aviator in World War I. He employed his Wall Street business training to form an upscale air taxi service in 1922 and expanded the service to Florida and the Caribbean. Pan Am’s first flight took place October 19, 1927, from Key West to Havana in a Fairchild FC-2. Pan Am expanded worldwide and even increased its scope during World War II. Trippe is responsible for several innovations in the airline world. A firm believer in the idea of air travel for all, Trippe is credited as the father of the tourist class in the airline industry. Jet flight was introduced in 1958 and Pan Am was the first airline to employ the Boeing 747 in 1965. Trippe gave up the presidency of the airline in 1968 and passed away in 1981, and Pan Am went bankrupt in 1991, its assets purchased by Delta. 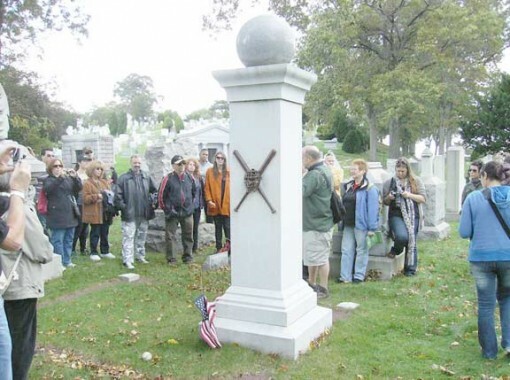 ForgottenFans assemble at the gravesite of Elias Howe, recognized as the inventor of the sewing machine. As is the case with the telephone (invented by Meucci but recognized as by Bell), Howe was not the first to conceive of a sewing machine, but he was the first to obtain a patent of a sewing machine using a lockstitch design, which became the workhorse model for many years. Howe was forced to defend his patent in a court case that lasted from 1849 to 1854 because he found that Isaac Singer with cooperation from Walter Hunt had perfected a facsimile of his machine and was selling it with the same lockstitch that Howe had invented and patented. He won the dispute and earned considerable royalties from Singer and others for sales of his invention. 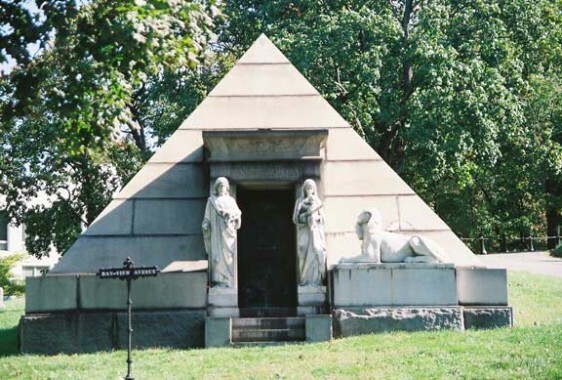 Howe’s beloved dog Fannie was laid to rest behind his monument — a very unusual occurrence. 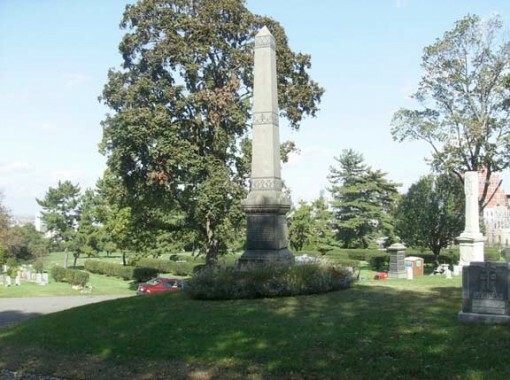 One of the Cemetery’s foremost promontories and vistas can be visited at the monument for harbor pilot Thomas Freeborn, who was killed trying to guide the John Minturn into New York harbor during a severe storm in 1846. The Minturn is depicted on the front of the monument, and you will also find carvings of anchors, capstans, and a mast cut short, representing his foreshortened life. The female figure on the monument represents hope. This poignant moument, sculpted by Patrizio Piatti, depicts the last morning in the life of Jane Griffith: August 4, 1857. Her husband Charles is shown saying goodbye to her, while a carriage waits at the right to take him to work. When he returned home, he found her dead, a victim of a heart ailment. Charles visited his wife’s grave weekly for the next 25 years until his own death. 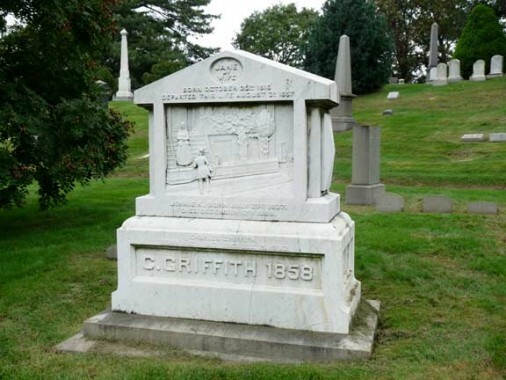 Note the detail in the sculpture, such as the 6th Avenue horsecar Griffith used to go to work. Nearby is the gravesite of Charlotte Canda, whose life ended in a carriage accident February 3, 1845. She was 17. 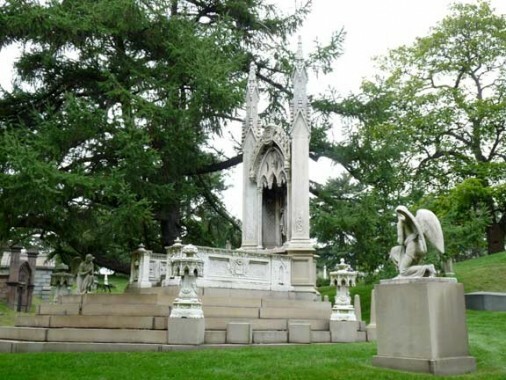 Her father built a monument 17 feet high, 17 feet deep, with 17 sculpted rosebuds that was based on a sketch by Charlotte for an aunt’s tombstone. Her fiancé, Charles Albert Jarett de la Marie, later committed suicide and is not buried on the same plot because of Roman Catholic law. His grave can be found a little to the right of the monument. 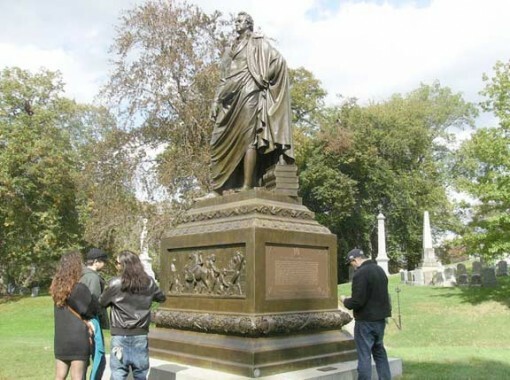 DeWitt Clinton’s large monument stands just north of the Cemetery entrance. 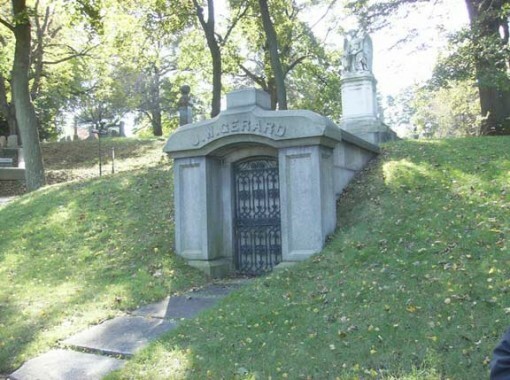 Elected to the House of Representatives and the Senate from New York State, as well as NY State Governor, Clinton’s memorial was Green-Wood Cemetery’s first tourist attraction. He was a driving force in the creation of the Erie Canal; public education; and the abolition of slavery. He lost to Madison in the presidential election of 1812. In its early days the Cemetery was struggling as a not for profit and needed publicity. It was arranged through a Clinton descendant to disinter him from his Albany gravesite and transport him to Green-Wood. His grand setting in a grassy circle has been here since 1853. We’re fortunate that the cemetery’s chapel is once again ready to accept worshipers. It was closed from the early 1980s until around 2000 from lack of demand for services. It was built by the firm of Warren and Wetmore (who built Grand Central Terminal) and was finished in 1911. It is a reduced version of Christopher Wren’s Thomas Tower at Christ Church, Oxford UK. 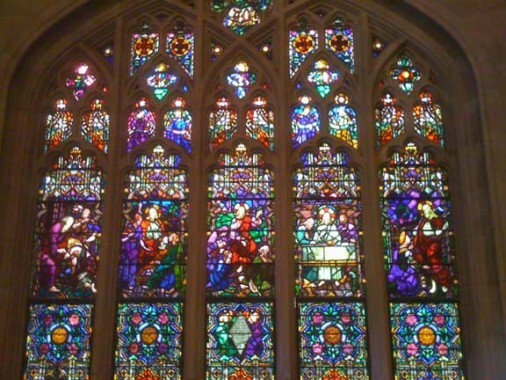 Go in and check its sumptuous stained glass. Though Louis Comfort Tiffany is buried nearby, these are not Tiffanys; only one mausoleum in the cemetery, Marcus Daly’s, can boast Tiffanys. Actually he is right- they EMPLOYED Boeing to design the aircraft in 1965 for them, signing the contract to build a few months later in 1966. They didn’t actually get the aircraft DELIVERED until 1969 and didn’t see it enter REGULAR SERVICE until 1970. 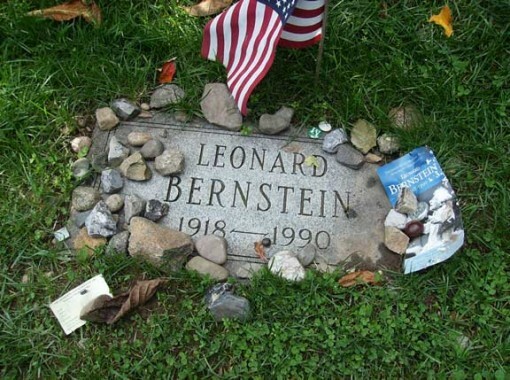 Leonard Bernstein’s marker appears to have collected stones from visitors. Is this some kind of local custom? Lovely pictures and histories of Green-Wood ! Learning a lot from your site….found your stories on Mt. Zion and its older family plots so interesting. Glad I found you…recomended you to my Dad who loves local lore…. There are some good books available about Green-Wood. 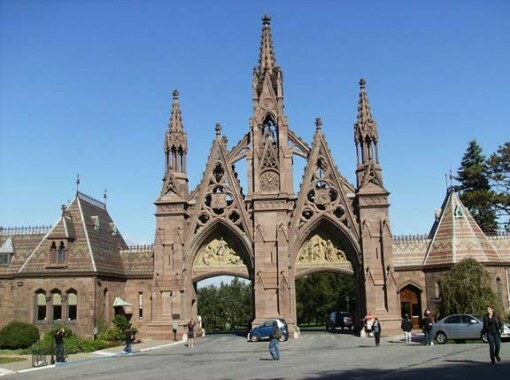 Try “Green-Wood Cemetery” by Alexandra Mosca from Arcadia Publishing, a reasonably priced work sold at Green-Wood, at book stores and through Amazon and Barnes and Noble. Lots of archival photos in it and a concise text about the cemetery and its history. 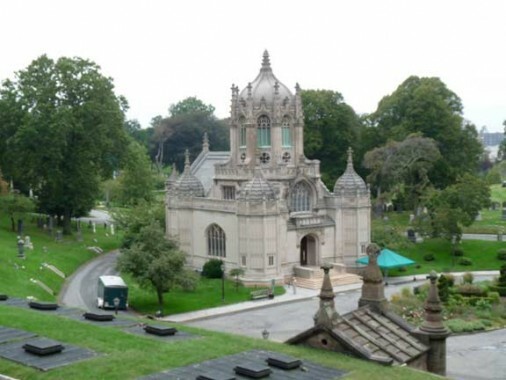 Good to see this; lots of my family are buried in The Green-Wood Cemetery ! The Brooklyn theater Monument and the Triangle Shirtwaist plaques are the few notes that we have of these tragic events; many think that the Triangle Fire killed the most however up until 11 September 2001 the largest single day death toll in NYC was the burning of the General Slocum with it’s cargo of mostly women and children out for an excursion sponsored by their Church. The ship was not pulled back into the docks and it sailed until it grounded on –is it North Brother Island?–many or even most did not know how to swim and of course the women mostly had long dresses that quickly pulled them under. 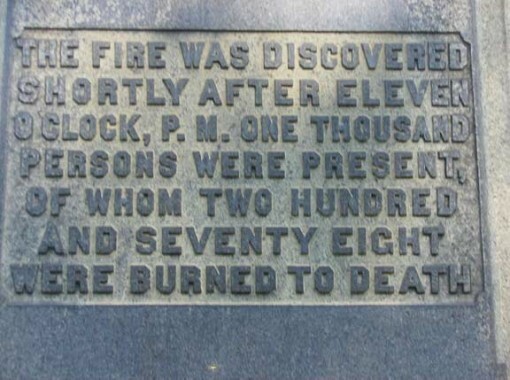 Few actually burned; most drowned. There are two monuments to this in NYC. Mostly forgotten except by their families.